The rationale behind the Vienna Convention on Contracts for the International Sale of Goods (CISG) is that a uniform sales law will lead to improved efficiency of cross-border sales and promote international trade. However, although it continues to attract new Member States and now applies to more than 80% of global trade, commercial parties often exclude the CISG, questioning it as a desirable choice of law. choices of law in different jurisdictions and likely future changes in choices. By bringing together cross-disciplinary elements of empirical research, statistical analysis, economic and behavioural theory, and their doctrinal implications, this book presents a contextual and realist insight into how and why harmonized international sales law is utilized in global trade. 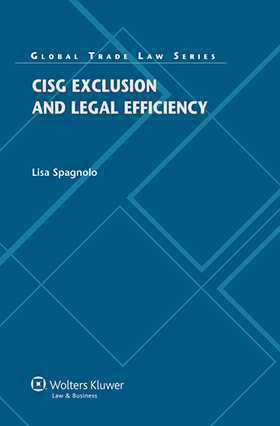 It brings all existing empirical and anecdotal evidence together and draws significant conclusions about the present and future of CISG exclusions. Practitioners in international trade, arbitrators, government officials, and academics will all welcome its enormously useful fund of information, and lawyers interested in whether excluding or including the CISG is in their clients’ interests will here find means to improve decision making and increase their confidence in providing effective advice. Chapter 2 Birth of the CISG: Its Applicability and Nature. Chapter 3 Economics and the CISG. Chapter 4 The CISG and Efficiency: Substantive Advantages and Disadvantages. Chapter 5 The CISG and Efficiency: Non-substantive Advantages and Disadvantages. Chapter 6 Lawyer Opt-Out Rates and Reasons. Chapter 7 Interdisciplinary Analysis of Lawyers Choices of Law. Chapter 8 Interpretation in Light of Reasons for Exclusion and Efficiency. Chapter 9 Precontractual Liability and the Efficiency Dilemma. Chapter 10 Exclusion by Conduct of Legal Proceedings.